I purchased a Soundtraxx Sierra sound system to install in an Aristo C-16 (about $150 from Tony's Train Xchange). The Sierra system is available with a ROM with recorded C-16 sounds. There are also ROMs for several other popular narrow gauge prototypes. As of June 2000, the Sierra is available with diesel sounds for Alco and EMD prime movers. I feel that the Sierra is the best value available overall in large scale sound system. The sound quality is at least equal to the much higher priced Phoenix system and it has more sound features, is more programmable and provides some lighting features as well. Its sound quality is MUCH better than the lower priced digital systems (Dallee and PH) but it costs only about $30 to $50 more. The Sierra works well with both DC track power and PWC track power. It integrates well with any kind of DCC decoder or R/C receiver with the addition of a few inexpensive external components. Overall, the Sierra sound system is quite good, but it has one really annoying characteristic. The track voltage controlled whistle triggers much too often, especially when PWC is used to power the track. There are adjustments that reduce the sensitivity of the triggering and eventually I did find a combination of settings that suppressed the voltage controlled grade crossing signal, so much so that I can't even make it happen now. That's OK, its better without the whistle signal. To realize the full capability of the system, you MUST pay careful attention to the treatment of the speaker. Some of the less expensive systems (PH and Dallee) don't sound much better with a high quality speaker than they do with a typical 3" speaker. The Sierra has capability that a cheap 3" speaker (i.e. the one that comes with it) can't reproduce. I recommend that you fire the unit up on your workbench before you install it and connect it to a good speaker in a good cabinet just to see how different it sounds. At that point, you should be convinced to go to extraordinary lengths to optimize the speaker installation to the maximum extent possible. The obvious place to install the system in a C-16 is in the tender. The C-16 tender is just wide enough to hold a 3" speaker and it is molded with very heavy walls so that it makes a good speaker enclosure. There are no significant air leaks once the tender body is fastened down. The tender floor is flat and relatively free of obstructions. I considered installing a large oval speaker in a trail car but since I didn't have one handy, I elected to do the best that I could in the tender. Eventually, I did find a better speaker that would fit, see below. The tender floor must be drilled to let the sound out. I placed the speaker (a 2 watt Radio Shack 40-252) and marked it. Then I removed the trucks and the brake rigging underneath and marked the locations of the floor beams. I then drilled a pattern of 5/16" holes. One extra 5/16" hole was drilled to mount the power switch and a 1/4" hole was drilled to mount the external volume switch (a regular center-off momentary SPDT sub miniature toggle switch can be purchased separately). The battery is mounted at the rear with double stick foam tape and the sound board is mounted on top of the battery with another piece of foam tape. The power switch is just glued to the tender floor with CA. The volume switch mounts with its supplied nut. Power for the system is taken from the track power wiring that was already in the tender. Soundtraxx recommends that an optional external battery charging jack be installed so that the battery can be charged offline. I found that with Aristo PWC on the track, charging the battery offline is not necessary. The battery begins to charge at the first crack of the throttle so that it tends to stay charged even with extended slow speed running. The Sierra can be run from a battery powered loco main battery instead of its own battery. The Sierra draws about 250 to 400 mA (excluding any lighting loads) from the battery terminals at input voltages above about 6 volts, so that if it is run directly from your loco's battery power, it will be a significant drain on your main battery. It could be connect to the loco motor and run from its own battery at low speed and charge from the motor control circuit at higher speed but it'll still draw a fair amount of power. It could also run dead loss from its own battery (about 45 minutes run time) by connecting the motor controls through optoisolators as shown in the Sierra Tech Note #6. The Sierra system can use a voltage controlled "auto exhaust" feature to set the chuff rate. 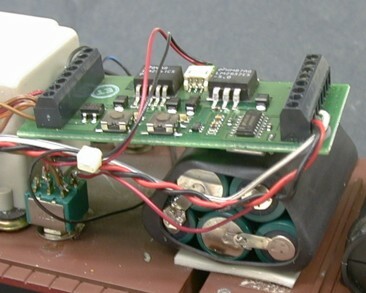 It can also use a reed switch and wheel mounted magnets. Since I broke the reed switch trying to adjust its position, I initially used auto exhaust. The auto exhaust feature can be adjusted for start voltage and maximum chuff rate. It will work well enough on either pure DC or pulsed power, but not with the same settings. Auto exhaust works OK, but it doesn't track the engine speed really well in all situations. I eventually installed a left over reed switch that had come with a PH sound system on the front truck with Zap-CA CA. I mounted two magnets with Zap-CA CA to the front axle. This particular reed switch actually worked better than the original switch as it worked at a larger distance from the magnets. Since the tender wheels are smaller than the drivers, two magnets on a tender axle result in about 3 chuffs per turn of the drivers. This is OK, because the sound system really doesn't tolerate a chuff rate much higher than that anyway. Sierra provides only two triggering magnets with the sound system, but you can get more suitable magnets at Radio Shack (p/n 64-1895) for about $1 a pair. Several other sound features are controlled by track voltage. The bell will come on and go off again at settable voltages. The whistle will toot two times for forward and three times for reverse when starting and toot once after stopping. The compressor rate is determined by the rate of decrease in track voltage (stopping faster indicates that you used more air and the compressor will run faster). After the system detects that it has been standing for awhile, "Fireman Fred" will shovel some coal and then use a grease gun. If the system detects an increase and then a decrease in input voltage, it will blow a grade crossing whistle signal. It is this effect that is so annoying because it seems to blow too often. 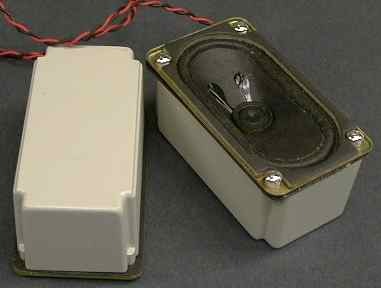 The whistle has three modes, voltage controlled, switch triggered, and switch controlled. In the voltage and triggered modes, the forward, reverse and stopped signals play automatically. In voltage mode, the grade crossing plays at an increase then a quick decrease in track voltage. In trigger mode, the grade crossing signal plays when triggered by a switch. In controlled mode, it plays as long as the whistle input is held closed, but the automatic forward, reverse and stop signals then do not play. This is intended for direct DCC control. 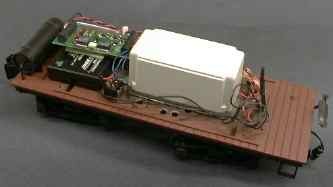 I would like to see a fourth mode, one that combines the voltage and control modes so that the common movement related signals are automatic, but it is still possible to "play" the whistle under remote control. The C-16 version of the Sierra system has a "controlled" whistle that changes in pitch. This makes using the controlled mode to blow whistle signals difficult as the system does not respond well to attempts to blow a short signal. If you try to blow a very short signal, the whistle doesn't sound very good. Holding the whistle a little longer and it starts to shift pitch. Stopping the signal while the pitch is shifting sounds terrible. I abandoned the attempt to use the controlled whistle signals for this version of the Sierra. Other models with different whistle recordings may respond better. All of the accessory features can be controlled by track voltage and there are settings that determine when they turn on or off. These settings are dependent on the kind of track power that you use. They can be set to work properly with either pure DC or PWC, but not both. If you set up for PWC, then the features will activate with pure DC at much higher engine speeds. The Sierra has 20 different settings to turn on, or off, or to adjust the various sound and lighting features. These are programmed with the aid of two switches and two LEDs. Setting all of this stuff takes time and patience but at least the instructions are reasonable. I would recommend NOT permanently reinstalling the shell until you are sure that you've got it the way you want it. You can use the external volume switch to do the programming, but to really be sure of what is going on, you have to be able to see the two LED indicators on the circuit board. The Sierra has two lighting control outputs that can be used to drive a flickering firebox among other effects. The system is designed to switch 6 volt loads because the lighting power is derived from the Sierra's 6 volt battery. There is a 100 mA current limit on each of the lighting outputs. You can use LEDs or GOW bulbs that run from less than 6 volts with a current limiting resistor. Running lighting effects will impact the battery life of the sound system. If you are going to use the outputs for a flickering firebox, Radio Shack sells 6 volt 60 mA lamps that come three to a package, one green, one red and one yellow. They are brighter than most LEDs and project light in all directions. Toss the green one and use the other two in the firebox. The red one works best for the constant flickering firebox. The bulb is a little too pink by itself, but a light coat of Caboose Red on the bulb makes it just right. Use the yellow one for the "smart" flickering firebox light. It will come on when Fireman Fred opens the firebox door and tosses in more coal (or wood in my case). There is another sound feature of the Sierra that I didn't use. This is the coupler clank. If you mount your coupler so that it has a little forward and backward slop, and mount a microswitch behind it that will close when the coupler is tapped, the sound system can produce a "clank" sound that represents coupler knuckles banging together. Even the moderate quality Radio Shack speaker sealed in the tender shell left me unimpressed. The sound was better than with Sierra's speaker but it was still too tinny. It didn't sound nearly as good as the system was capable of, but I thought it was the best that I was going to get with a speaker inside the tender. Then I stumbled across these 2" x 3.5" oval speakers at a local ham radio and computer swap meet. They were $1 each and are rated at 8 ohms and 6 watts. They even come with their own enclosure. After testing one, I was astounded how much better it sounded. I then kicked myself for not buying the whole case that the vendor had. Maybe he'll be there again next month. I was very lucky that the swap meet speaker and its enclosure just fit in the C-16 tender. I had to reroute some wires that went to the front truck, but the new speaker and its enclosure were not difficult to install. The improvement was so dramatic that I have abandoned the thought of using a speaker in a trail car. The moral here is pay attention to your speaker. The selection and installation of the best speaker that you can get will make or break the sound quality of this top end sound system. The Sierra draws current from the track when it can. If there isn't enough track voltage available, it draws power from its battery until the track voltage is high enough again to provide enough power. It also tries to recharge its battery, but the battery usually tends to discharge over time. You need at least 8 volts on the track before any load at all is taken off the battery and about 10 volts before any serious charging occurs. The current drawn by the Sierra varies greatly over time depending on what kind of sound the system is making and how loud the system is set. The table below lists approximate currents for various Sierra modes. Since the running sound takes 200 mA or so and the max charging rate is only 60 mA, if you run slow, you can only do it for about 1/3 of the time or the Sierra's battery will eventually loose charge. Even sitting idle, the Sierra will flatten a fully charged battery in about 24 hours. I purchased a Soundtraxx Sierra Alco diesel system at the 2000 Queen Mary Big Trains Show. This was their first diesel release. When installed in a regular track powered loco, it worked fine on DC track power with a good match between the locomotive speed and the engine sound. It worked well enough with PWC on the track, but not quite as well as with DC. However, when I tried to interface it to an Aristo 5490 onboard receiver and later a Lenz and then a Zimo DCC decoder, I had serious difficulties. I spent a period of a year mucking around with the interface before I got it right. The final version of the interface should work with ANY Sierra (steam or diesel) and ANY R/C receiver or DCC decoder. Check out the next section for links to specific Sierra installations where some of these problems were solved. The Sierra senses the voltages on its pin 7 and 8 to determine what to do. If pins 7 and 8 are connected to the track, in effect, the differential voltage between the pins is used. High voltages at these pins both allows the Sierra to sense direction and speed as will as providing power to run the unit and charge the Sierra's internal battery. With extended running at low speed, below 8 volts, insufficient power is available to keep the Sierra's battery charged and after maybe 45 minutes or so, the battery will run flat and the sound system will start making a popping sound. If this happens often in straight track powered installations, then the Sierra must either be run faster for longer periods or it must be taken out of service to charge the battery off line. Up to 8.2 volts input, the Sierra only draws a few mA from the track. This is enough for it to sense track voltage, but not enough for it to start charging its own battery so its running from and discharging its battery. Above 8.2 volts, the system can start to charge its battery AND run itself from the track, consequently the current shoots up. At 19.2 volts, the Sierra simply shuts down and drops back to idle. DCC and constant track power systems have power available all the time. The easiest installation method for DCC is to connect the Sierra right across the motor so that the Sierra doesn't know that it isn't hooked to the track. However, connected this way, the battery charging problems will still occur. The Sierra can be run directly from the track in DCC or constant track powered systems so that, in theory, it doesn't need the battery. However, it really doesn't work out too well. Soundtraxx recommends using a 2000 uF capacitor to provide some stored charge, but unavoidable track power dropouts will always occur and the capacitor really isn't enough, the Sierra will reset too often. Short dropouts aren't a problem for most DCC decoders, but they drive the Sierra nuts and you can plainly hear the result. The battery assures that the Sierra will see a steady source of power all the time. To run the Sierra from DCC or constant track power so that it never runs down, some special connections are necessary. If the Sierra is being run from an internal traction battery in a battery powered loco, then its own battery is not required but the interface show below may still be required to get the Sierra to work just right. Soundtraxx provides two technical notes for connecting the Sierra to DCC decoders or the Aristo 5490 mini-receivers. You can find these at Technical Note #6, R/C Installation Notes and Technical Note #7, DCC Installation Notes. Neither proved to be completely adequate. There are peculiarities with both the Sierra and various other equipment that may or may not be handled properly by the circuits provided in those notes. The diesel Sierra has a sensitivity adjustment (programming step #2) to set how fast the system ramps up in speed with increasing track voltage. On this SD40 system, I could find only 7 discrete throttle notches, there should be 8 in addition to the idle position (notch zero on the curve). If you compare this curve with the one above, it is clear that the Sierra will draw a lot of input current on the higher notches in anything but the highest sensitivity (25%) setting. Since the optoisolators used in the schematic below can't source much current, this is the only setting that will work when the inputs of the Sierra are optically isolated. The key making a Sierra work correctly with a DCC decoder or R/C RX involves understanding of exactly how the Sierra responds to the voltages applied to pins 7 and 8 (the input pins) with respect to pin 2 (the Sierra internal and battery ground). Pins 7 and 8 drive a bridge rectifier within the Sierra. It takes a couple of volts of input to get the diodes to conduct at all so that the track voltage must rise at least that high before the voltage controlled effects can even start. The voltages at BOTH pins 7 and 8 must drop to very near zero, less than 50 mV, before the Sierra will detect a stop. If the voltages at pin 7 and 8 start to rise together, the Sierra will get confused and usually blow a forward start signal. The voltage between either pin 7 or 8 and pin 2 will determine the magnitude of the sound effect. More voltage makes a faster sound. However, the response is highly non linear. It takes about 2.5 volts to make something happen at all, and then the system will max out at something like 5 volts if the RPM sensitivity (diesel systems) is set to maximum (25% at programming step 2). When running from optically isolated inputs, you can't set the sensitivity higher to linearize the response a little because the Sierra will start to draw some serious input current at voltages above 7 volts and the optical isolator can't provide it. The start voltage adjustment (programming step 1) has some effect on this, but not enough. You can increase the start voltage, but you can't decrease it. When running from optically isolated inputs, this minimum input voltage gets to be a real problem. The engine will get to about half speed before the sound system will budge off idle. While the Sierra might sort of work with some DCC decoders or R/C receivers with some combinations of programming, problems may still occur. These are listed in decreasing degree of importance, but if any of these things happen, it needs to be fixed. The forward and reverse whistle signals may not correspond to the loco direction. If the whistle signals works at all, the Sierra may blow the forward signal in either direction which will mess up the directional lighting too. The directional problems occur because the internal ground voltages in the Sierra and the motor controller will usually not match well enough to allow the Sierra to detect when zero speed is reached. The motor speed problems usually occur due to the differences in the way the various manufacturers operate the output switches of their PWM motor controller circuits. In any event, ALL of these problems can be solved with some simple interface circuits. If the Sierra battery power input is to be connected to some form of track power, it is not reasonable or safe to expect it to be able to sense motor speed by a direct connection to the motor circuit at pins 7 and 8 too. The solution is to connect the Sierra directly to other circuits ONLY at the battery power input. All of the other signal connections between the Sierra and the controller should be through optical isolators. The schematic below shows the connections between a generic DCC decoder and the Sierra. This circuit will work with the Aristo 5490 as well. The bell and whistle isolators are not required however for the 5490. The ART-5495 accessory controller has isolated reed switch outputs that can be wired directly to the Sierra effects triggers. The circuit doesn't care what kind of motor driver circuit is used, it'll work with them all. Soundtraxx recommends running the Sierra from track power through a rectifier and a large voltage dropping resistor. This method is insufficiently precise so I have substituted an adjustable regulator set to 9.8 volts. This regulator both powers the Sierra and charges the Sierra battery. With constant track power, the battery should not be necessary, but short power dropouts that may not impact the DCC decoder or RX much will cause the Sierra to reset and pop which is annoying. The battery provides an uninterruptable power source to the Sierra. Even a mostly dead battery will do. The 1N4001 diode and 22 ohm resistor make a trickle charger for the battery and provide voltage dropping to keep the thermal stress off the Sierra. As long as the loco is sitting on powered track, moving or not, the battery will receive charge. The power switch disconnects both the power to the regulator (to allow decoder programming) and to prevent the battery from being discharged during storage. The optoisolators connected to pins 12, 13 and 14 are for the bell and whistle sound triggers. Others can be added in the same fashion for coupler clank or other triggerable effects. The key to this arrangement is the circuit to the right. There are two identical interface circuits, one for forward and one for reverse. The pulse voltage across the motors is applied to two 4N25 optical isolators. The LEDs in the isolators are wired back to back so that only one is on at a time. This provides the polarity sensing. When the first motor pulse is received, one opto isolator will start to conduct and turn on the 2N2222 (or any other general purpose NPN) transistor. Its collector voltage will go from 9.8 volts to nearly zero, turning on the 2N2907 (or any other general purpose PNP) transistor. The 0.1 uF capacitor retains some charge and keeps the 2N2222 turned on between motor pulses. When the 2N2907 turns on, it pulls up either pin 7 or 8 from zero to about 2.5 volts (as determined by the 3.3K and 5.6K resistors and the impedance of the Sierra input pin). This pre biases the input pin just below the point where the sound effect will start to ramp up. The increasing width pulses from the 4N25 will start then dragging the input voltage to the Sierra higher with increasing motor speed. At 100% PWM duty factor, the voltage at pin 7 or 8 will increase to about 5.5 volts, enough to reach run 8 or maximum chuff rate but not enough to cause the Sierra to start to draw significant input current at pin 7 or 8. While all this is happening at one Sierra pin, the voltage on the other pin will do nothing, it'll stay at zero with respect the Sierra's internal ground (pin 2 or the battery black wire). The diode in the interface circuit (any kind of silicon diode such as a 1N4000) prevents the 2.5 volt output bias from latching the 2N2222 on forever. When PWM pulses stop and the motor comes to a stop, the 4N25 will stop conducting, the 0.1 uF capacitor will discharge and the output voltage to pin 7 or 8 will drop to zero, allowing the Sierra to detect it and blow the stop signal. Another trick that can be done is to preset the engine speed off idle as soon as the motor controller starts to make output pulses. This is done by reducing the 3.3K resistor to about 1K. This will set the engine speed at the top of notch 1 at the very first sign of motor pulses. To bring the loco off idle, advance the throttle to its first speed step and then wait a couple of seconds for the loco sound to rev up. Then start increasing the throttle and the sound system will start ramping through its notches just as the engine begins to move. Notch 8 will be achieved at maybe 60% of full throttle and stay there through the higher speed ranges. If you don't want the engine to reach run 8 until full throttle, increase the value of the 100 ohm resistors connected to the optoisolators. All this may seem a little complicated, but it works every time. The Sierra comes with a 6 volt gel cell lead-acid battery to allow the unit to operate when the track voltage is too low to power the unit. There are two kinds of batteries, the standard one (left) and a thinner "slimline" version (right). The slimline version has the same rated capacity of 0.5 Ah but it doesn't seem to do as well. These particular two batteries have the wires clipped because they are absolutely dead, which is the reason for this section of this page. Lead-acid batteries are inexpensive and rugged when treated properly, but are probably not the best choice for a battery in sound system service. If the loco that the Sierra is installed in is run at low speed for extended periods, the battery will discharge and go flat. A typical Sierra will run between a half hour and an hour without any battery charging at all. At that point, the Sierra will make all manner of ugly popping sounds and, depending on how it is programmed, may blow the whistle madly. When it starts doing this, it's time to run it MUCH faster for a few hours to get some charge back into the battery to protect it. It is better to set the engine out with the motor turned off but with full track voltage to let the Sierra's battery recharge fully. This may take 12 hours or more. 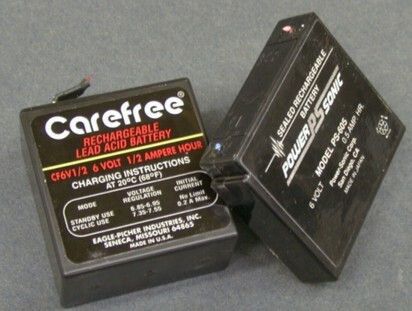 Lead-acid batteries ABHORE being left in a discharged state. 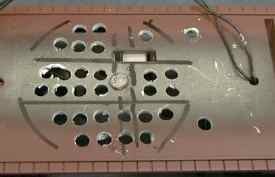 Leaving a lead-acid battery flat will allow it to sulfate and permanently fail. If you accidently leave the Sierra on while the train is idle, it'll shut down after a minute or so, but it will continue to discharge the battery at a low rate. Even then, depending the the state of charge of the battery, it will go flat in less than 30 hours and sit that way. The battery may never wake up again. This has happened to me twice. One system was left on for a month. In a second, the battery was never in really good shape even when it was new. Both batteries eventually failed and wouldn't accept even a little bit of charge. A battery changeout was in order, but not with another lead-acid battery. This system needs a battery that can go flat and pick itself up again without damage. I selected the NiMH battery technology to make two replacement battery packs. The NiMH (Nickel Metal Hydride) technology is the most resistant of any of the available technologies to being left flat, partially charged or partially discharged or recharged from a partially discharged state. These NiMH cells are rated at 1650 mAh, have solder tabs and were relatively inexpensive (~$3 each at Hosfelt). I have been told that a Sierra will run fine on 4.8 volts (4 cells worth), but I already had 10 cells handy so I made two 6 volt packs to replace the two dead Sierra batteries. Even though this kind of pack has about the same volume and weight as the stock battery, it'll run the system up to 3 times as long between charges. It'll also take 3 times longer to fully recharge. The heat shrink tubing used to make this pack is 1.5" in diameter before being shrunk. This 5 cell pack is almost a direct physical fit for the standard Sierra battery. 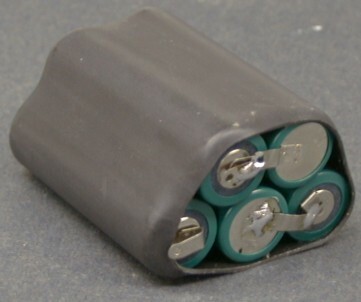 4 cells laid in a row would be a good physical fit for a slimline battery. The system worked fine right off and shows on sign of unusual troubles. NiMH cells can sit in storage in any state of charge or be recharged from any state of charge without damage. NiMH cells do have a higher self discharge rate than lead-acid batteries, so they may go flat by themselves if not run for several months, but they will recharge readily. In any event, if you run the system flat, let it self discharge, or leave it on until it goes flat, you won't be damaging these batteries. When the battery, stock or replacement, does need to be charged, the most effective way to do it is overnight. Just running a train fast won't do it completely unless you run 24 hours a day. I set the train on the track at full voltage with the motor off and the volume turned down for a full day if possible. If the loco doesn't have a motor switch and the system is in the tender, I remove the loco from the track and let the tender charge by itself. 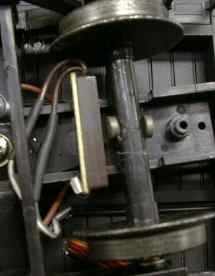 The Aristo Railbus doesn't have a motor switch, but the motor block can be easily unplugged without taking the unit apart. For the NiMH packs described above, and the Sierra's limited charging rate, it may take 2 full days to fully charge the battery. You can find a list of various sound system installations, including the Sierra, at other pages on this web site or other web sites. A list of links is available on my Sound Tips pages.